The homeowners use the ca. 1920 Copper Clad wood-burning stove for cooking and heating the kitchen. Summer in Paris—that’s Paris, Idaho, a quiet ranching and farming town in the remote southeastern corner of the state, with just over 500 residents. The town isn’t French; it got its name from old-time surveyor Thomas E. Perris, and the spelling changed over time. 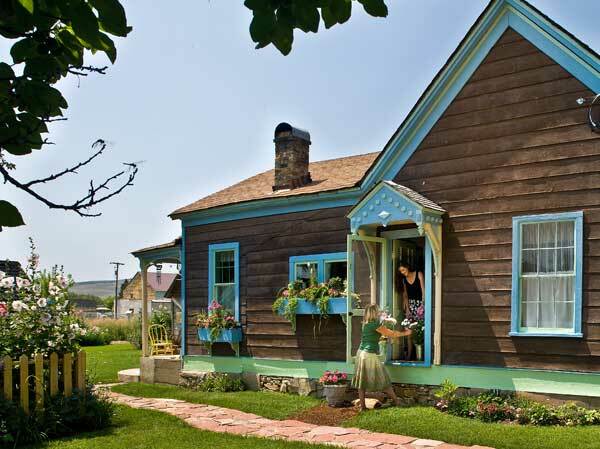 It was the spacious farmland and wide vistas, and the 1864 Victorian farmhouse, that attracted Salt Lake City residents Jerry and Janet Erkelens. They bought the house on two and a half acres for their summer getaway. The couple cleaned up and tossed out debris that first year. The house was unfurnished except for the cookstove. While they were clearing out, they found a table in the attic, built and signed by James Nye. 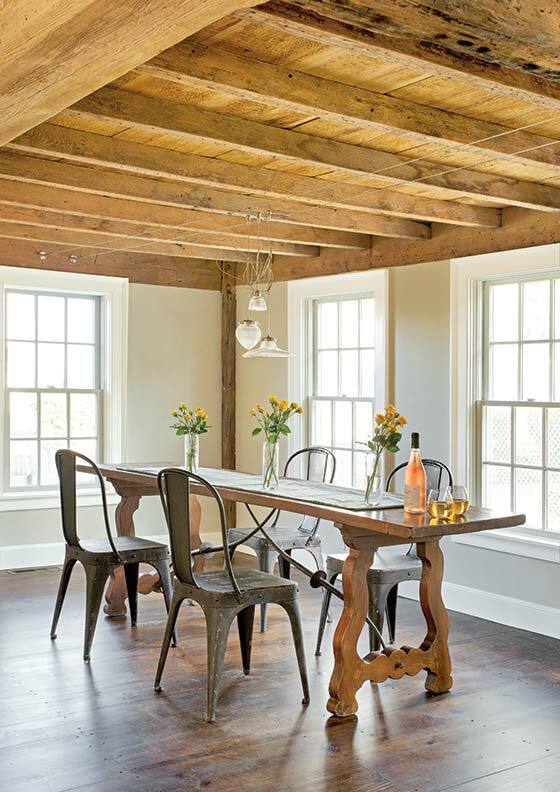 It was presumably made of oak salvaged from an army wagon, as the wood was imprinted U.S. Army. Oak is not indigenous to this part of the West, and since it preceded the railroad, the table is an unusual piece of pioneer furniture. Next came work on the windows and exterior painting. The bright trim colors—originally done in milk-based paint—reproduce historic colors determined by expert paint analysis. 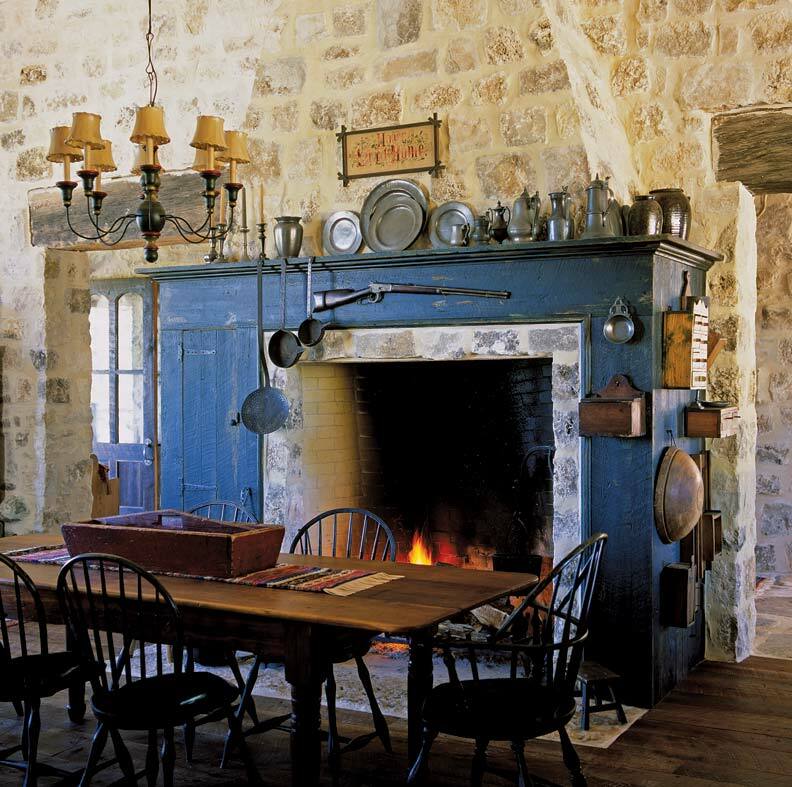 Inside, the first room to be overhauled was the country kitchen at the rear of the house. Investigation indicates that the Nye family replaced a lean-to kitchen as early as 1870 with a more permanent addition. The wood-burning stove probably arrived during an update around 1920, and the sink basin and kitchen cabinets date to the 1930s. Jerry removed the old wainscoting to strip its lead paint, then replaced it all according to a numbered sequence he’d noted. 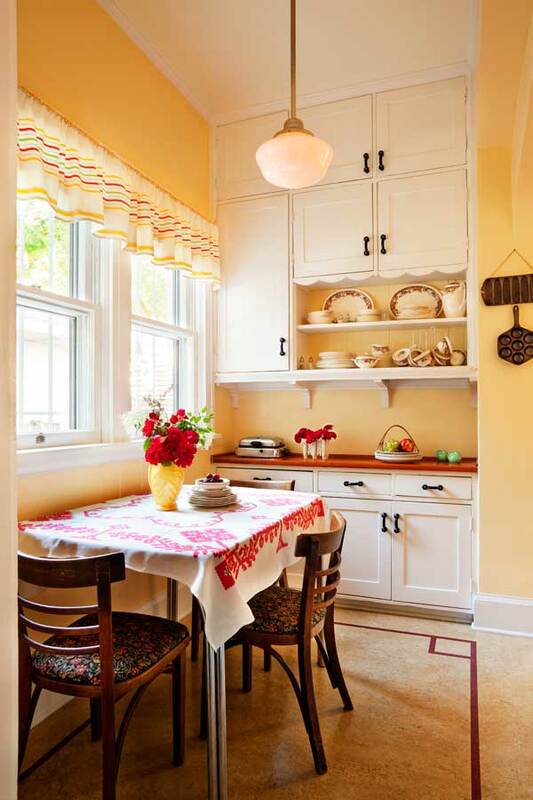 Janet chose the happy paint colors and repainted cabinets and walls. She added accessories that are largely local and of the period. 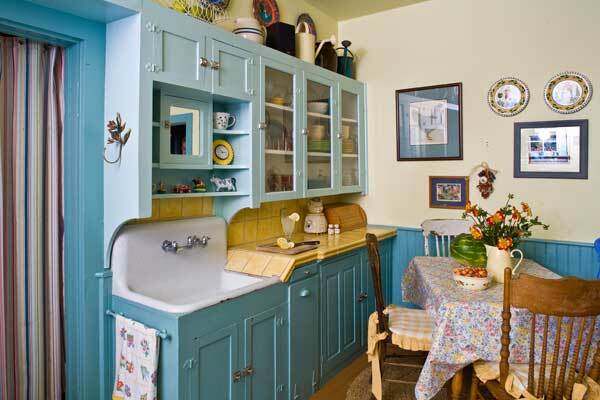 The cabinets and sink date back to a remodel, probably undertaken in the 1930s. The wainscoting is original; the owners stripped and restored it. At the same time they were tackling the renovation, the couple refurbished the landscaping and outbuildings. They planted an orchard and created generous garden spaces for fresh vegetables and flowers. Janet has become a familiar, welcome face at neighbors’ doors, as she makes regular rounds on her bicycle delivering surplus garden produce and bright bouquets. An expanse of manicured lawn is kept for the family’s tradition of playing highly competitive croquet. As they’d hoped, the Paris house is a magnet for their grown daughters and Salt Lake friends. Janet and Jerry place a big table outside in the capacious shade of the tree, and dot the tablecloth with specialty dishes communally prepared by a family of cooks from the bounty of the garden. Treetops echo with laughter, as they did a century and a half ago.